Metal flower, ribbons, printed transparencies, rick rack etc. 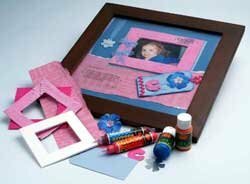 Decorate the frame using ribbons, printed transparencies, rick rack etc. Dry brush acrylic paint around the edges of your background paper. Tip: To dry brush, dip the paint brush in a small amount of acrylic paint, brush the excess paint off on a scrap of paper and then paint onto your background page using long strokes. Cut a tag from plain paper and cut a frame for your photo out of foamkor. Cut out your monogram letter from a firm cardboard. Place a small amount of Dala Glass Artliner on the edge of the tag and using a paint brush, smudge the liner over the edge of the tag to create a ‘washed look’. Set the tag aside to dry. Paint the Dala Puff Paint onto your frame and the monogram letter in a colour to match your layout. Tip: The layer of puff paint should be smooth and even. It would be a good idea to wear an apron when using puff paint and make sure you work on a scrap piece of paper. Using a hairdryer or a heat gun, heat the frame and monogram until the paint begins to puff. Tip: The foamkor tends to puff slightly less than the cardboard but creates different and interesting textures. Leave to cool down. Using the Dala Glass Artliner, carefully line the outside of the metal flower using one continuous stroke and leave to dry for at least 1 hour. Using the Dala glitter Artliner, gently add dimension to the blossom. This should be subtle. Allow to dry. Once all the paints and liners are completely dry, the page can be assembled. Tear strip of about 12 cm of printed paper and paste onto your background sheet about 1 cm from the bottom of the page. Adhere the blossom, monogram and any other embellishments using Dala craft Gluepen onto the tag. Dala products are available nationwide from al major arts and craft stores. For more information phone the Dala Helpline at 021 557 8003. This item has 673 views.